The Yeppoon colony had been there for many years, roosting in the mangroves at Ross Creek. And it looks as if they are there to stay until they decide it's time to move on. “It's illegal to destroy a flying fox roost,” said Mr Adair, who said the colony had fluctuated in size over time. “There are about 10,000 now where there used to be 50,000 and one of the puzzling questions is 'where did they all go? '” Cr Carter said there was a perception at the coast the colony posed a risk to human health and the council wanted to know if there was anything it could do. 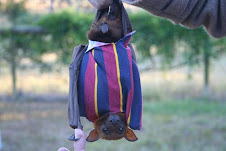 But Mr Adair said there had never been a single recorded instance in Queensland of health issues in humans caused by flying foxes, although he admitted he was not an expert on what people might catch from them. “Our advice is that they pose no risk,” he said, stressing that numbers were reducing and the species was under threat as suitable habitats were lost.